Can you believe it is Friday! Yippee! Any exciting plans for the weekend? We are working on finishing cleaning up from our house demo, and I've got a few Discovereighng with Dana things to take care of on my to do list. I'm also excited to go watch one of my nephews play baseball this weekend. So should be a fun weekend! I've also got a fun post to share with you today, the quirky Seattle Gum Wall. 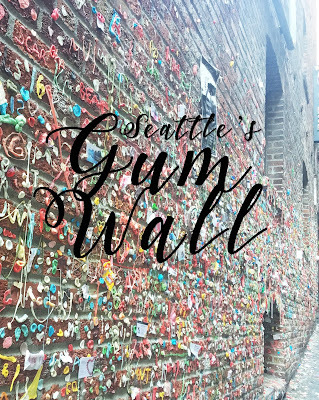 This gross, yet fun wall is located in Post Alley, and is must see while on your way to Pike Place Market. It is surprisingly beautiful, even though it's pretty gross at the same time. How does that work? The vast array of gum colors add to it's charm. They (whoever they is) say that if you don't leave your own chewed gum on the wall, it is bad luck! So, don't walk through without your own colorful, chewed gum. Are you superstitious? Will you leave your own chewed gum, or walk on by?